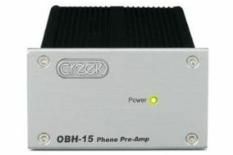 Creek Audio OBH-15 review | What Hi-Fi? Initial impressions of the OBH-15 are certainly good. Despite its basic looks, it feels well-made and pleasantly weighty. Creek has also included a simple, rear-mounted push button allowing you to switch between moving magnet and moving coil cartridges. Plugged in, it delivers a crisp sound that, when handling a spoken-word production such as the BBC's Under Milk Wood, adds warmth to the voices of the actors. Give it something more dynamic, such as Martha and the Vandellas' Dancing in the Street, and the Creek reveals a capacity for serving up bags of detail. Vocals sound good, and you get a nice, open midrange that's smooth and fluid. The top-end, however, is a bit too brilliantly lit, although the bass is nicely supple. What's most apparent about the OBH-15 is that it doesn't time as well as the class leaders, and it could do with some extra bite. If you prefer a relaxed listen, this is for you. It gives a sweet and detailed performance; we just thought it could do with a bit more verve.